Home of bankers, city brokers and the Chelsea football team, it's hardly surprising that Elmbridge in Surrey has more convertibles per head than anywhere else in the UK. The area, which includes the towns of Esher, Weybridge and Walton-on-Thames, has over 5,300 convertibles registered, or one for around every 25 residents, according to research carried out by Citroen UK. Surrey was the top county overall for convertibles, with four of its districts featuring in the UK top 10 for highest proportion of convertibles registered compared to residential population. The City of London and districts within the south east counties of Buckinghamshire, Essex, Berkshire and Hampshire completed the 10 most popular locations for convertible ownership. The results coincide with the 2013 Summer Solstice, the longest day of the year. In theory, the sun rose at 4.43am and will set at 9.21pm. But Elmbridge today is miserable under a thick layer of cloud cover. 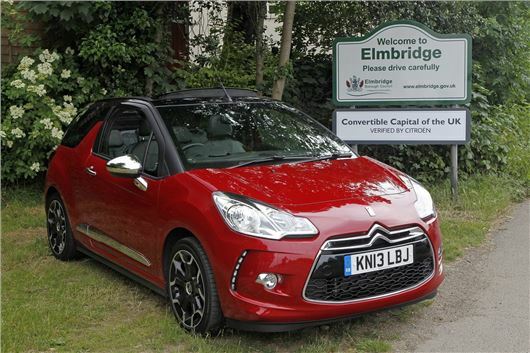 The research was undertaken by Citroen as part of the launch of DS3 Cabrio, the soft-top version of the popular DS3 hatchback. Citroen consulted registration data from the DVLA and census information from the Office for National Statistics to map the UK's convertible car hotspots. Despite its temperate climate, the UK has the second largest number of convertible cars per head of population anywhere in the world. Around 900,000 convertibles are currently registered in the UK out of a total 28.7million cars, accounting for 3.1% - or one in 32 - of all cars on UK roads. The average number of convertibles to population ratio is approximately one for every 75 people. The research also found that counties with greater household incomes had the highest rates of convertible ownership. ‘Convertible capital’, Surrey, is one of the top five areas in the UK for gross disposable household income, 37.7% higher per head than the national average. Kingston-Upon-Hull, one of the lowest areas for convertible ownership, has amongst the lowest average gross disposable household incomes per head, 29.6% less than the UK average. *DVLA information on the number of cars registered as of March 31 2012 showed that 5,329 convertible cars were registered in the Borough of Elmbridge, which was recorded as having a population of 130,900 in the 2011 Census.